Knowledge of Project Management Processes and tools is a professional requirement for all streams of engineering and also for Managers. MS-Project is a very important tool which can be used for scheduling and costing of Projects. Knowledge and Skills in MS-Project help the graduates of engineering stream and management in planning, executing and monitoring. Rigsum is a training and consultancy firm Head Quartered in Thimphu. Rigsum has served Offices like, BPC, Local Government, Wood Craft Centre, Ministry of Economic Affairs and many other Departments in the country. Rigsum has highly experienced and certified trainers and consultants, associated with it. 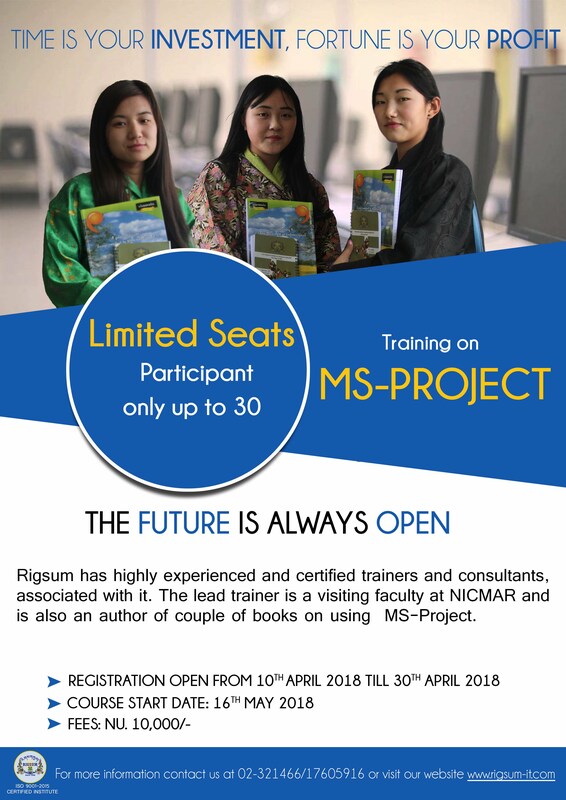 The Lead trainer is a visiting faculty at NICMAR and is also an author of couple of books on using MS-Project. One may visit the website of our associate partner www.pmskills.in for more information about the firm. Overview of the MS-Project Training. Assignment at the campus of Rigsum or in any convenient places either in Paro or Bumthang. The first 60-90 minutes will be used to discuss key essential concepts of Project Management (like WBS, Critical Path) using slide presentation. Subsequently, there will be live demo and video show to explain how to do something using MS-Project (like adding tasks, sequencing, defining resources). This will be followed by hands on workshops, where trainees will be asked to do specific relevant exercise from other sources. The training will conclude with Question and Answer. A sum of Nu. 10,000/- per participant will be charged which includes tea snacks, working lunch, note book etc. This fee is inclusive of taxes. Payment Schedule, Mode of Payment etc. The payment has to be done on the day of registration by transferring the fund to our accounts or by cheque. 1. The soft copy of the training material will be made available to participants. The trainees have to prepare hard copies required. 3. Free support will be provided for teams interested to do projects using MS-Projects in the near future. 1. Interested candidates can register from 10th April 2018-30th April 2018 either online or in person. Only 30 participants will be taken. The MS-Project training will start on 16th May 2018.